Dear brides-to-be of Ireland are you ready to say yes to a Fashion by Laina wedding dress? Our luxurious wedding dresses are now available with one of Dublin’s newest bridal wear boutiques. We are thrilled to announce that brides-to-be in Ireland will now have a fabulous boutique to try our awesome dresses. Rachel and Alan, the owners of First Impressions Bridal, will take care of you and help you find the perfect dream dress for your big day. They have hand-picked spectacular bridal styles from celebrated and sophisticated designers to give you a show-stopping look for the big day. Don’t forget to check out the latest edition of The Irish Weddings Diary magazine for an exclusive glimpse at our wedding dresses photographed in the beautiful village of Ballymagarvey. Whether you're a classic or an unconventional bride-to-be, you will discover yourself in our luxurious wedding dresses. 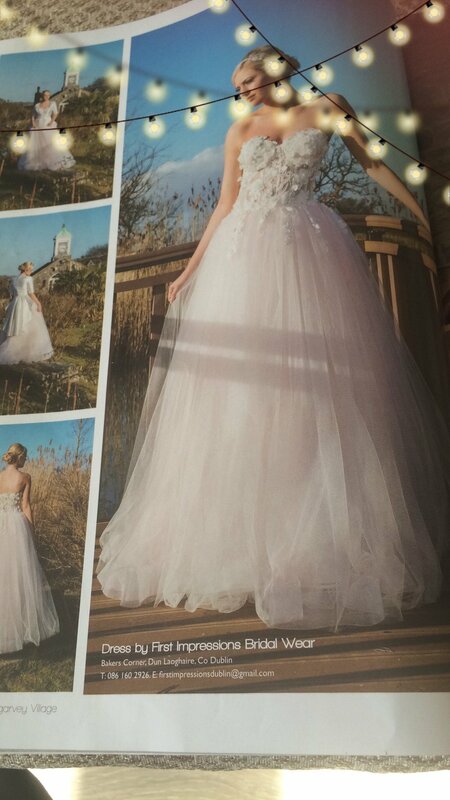 First Impressions Bridal in Dublin carries beautiful wedding dresses from our Rêve de Fleur collection. Each of our gowns is designed to tell a love story written in fine, lightweight and luxurious fabrics with lots of flawless hand-detailing. Ireland brides-to-be you will have a wide choice of sensational backs, sweetheart and V necklines to complement the classic and fabulous A-line gowns and the sensuous, fit-and-flare mermaids and fishtails. Explore our collection here to find the one dress that speaks to your heart. Follow First Impressions Bridal on Instagram or on Facebook for more beautiful bridal inspiration on your big day. To book an appointment for your Fashion by Laina wedding dress in Dublin, simply contact info@firstimpressionsbridal.com, 01-2300961 or 0861602926. Rachel and Alan are waiting to help you discover the most important dress you will ever wear at 1 The Forge, Bakers Corner, Rochestown, Dun Laoghaire. Interested in our wedding dresses? At Fashion by Laina, we work tirelessly to give our discerning customers a flawless fashion experience. We design and create with their happiness in mind. If you have been captivated and inspired by Fashion by Laina’s wedding dresses and would like to see more of our designs, book your appointment here or request your retailer guide at client[@}fashionbylaina.eu. First Impressions Bridal in Dublin is our exclusive stockist for Ireland. If you have any business requests, you can pass them over to them. If you'd like to become a stockist for Fashion by Laina, we welcome retailers to our headquarters for a full showcase of our designs. Come meet with us and see our Atelier, Full Selection of Bridal & Evening Collections, Fabric Samples & Production Unit. Our sales rep Aida is looking forward to guiding you through our exquisite bridal dresses and tell you all about our European-based manufacturing process and in-house design.